Note: These tips only address the types of strength training equipment typically required for videos. Dumbells are available in a huge range of weights. Many discount stores sell vinyl dipped, colorful dumbells (at left in photo), but the least expensive option is usually to buy the classic, hexagonal cast iron dumbells that retail for approx. 50 cents per pound (at right in photo). These can most reliably be found in stores that specialize in home fitness equipment (home gyms, treadmills, stationary bicycles). Chrome dumbells are attractive and comfortable to use, but often cost several times as much as the cast iron variety. In most cases dumbells can be substituted for a barbell, but as you progress a barbell can be a wise investment. Some exercisers may prefer the more even distribution of weight the barbell offers, as well as enhanced balance when lifting very heavy weights, but others will prefer to stay with dumbells. Padded barbells are the most comfortable, but cost more and are difficult to find. The FIRM sells a 4 foot padded bar through their Web site, and a company called Ivanko makes a similar product. If you don't want to pay a premium for a padded barbell, consider purchasing an inexpensive barbell pad or use 3/4" pipe insulation as padding. A body bar is similar to a barbell, only it has no plates and it is padded. The weight of the bar (usually 12-18 pounds) is evenly distributed across the length of the bar. Many people like using a body bar to vary their strength training program. Body bars are used in a relatively small number of videos, and you can nearly always substitute dumbells or an unloaded barbell for body bar exercises. Body bars are sold by several different companies, including the Step Company and Karen Voight's Fitness Arts Distributors. They are rather expensive compared to a barbell of comparable weight, and you cannot make a body bar heavier by adding plates. Bands are a versatile alternative to free weights--they are easy to pack when traveling, don't take up much space, cost very little, and you can adjust the resistance by changing where you grip the band. For many they are a good way to ease into strength training, and they make it easy to target specific muscles, though bands won't stimulate the amount of muscle growth that heavier dumbells will. A number of videos use bands in their toning sections--some even include the band along with the video. Bands are sold under brand names such as DynaBand or PowerFlex. Also called a step-up box, a 14"-17" step is used for many of the FIRM's strength training videos and a handful of others. This step is not used for aerobics, but rather as a stationary platform from which to raise and lower the leg to work the glutes, thighs, and buttocks. For those just starting out, a regular 8" step platform is good to start until you are accustomed to doing step ups with proper form. The FIRM sells their own tall step platforms (see www.firmdirect.com), but you can also use a Step Company step with extra risers or another stable surface. Some VF readers have suggested a Rubbermaid 13" toolbox/step stool as a cost-effective alternative--it sells for about fifteen dollars retail. When selecting a tall step height, remember that when one foot is on the ground and the other is on the tall step, the angle created should never be less than 90 degrees. 14" may be too tall for some shorter exercisers. 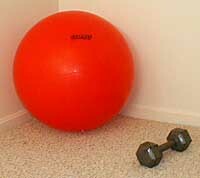 an inflatable, flexible ball you can use for strength training exercises. These typically cost around $15-25 US, and even less at discounters like Wal-Mart. There are a growing number of videos on the market that make use of the ball. See our index for reviews.